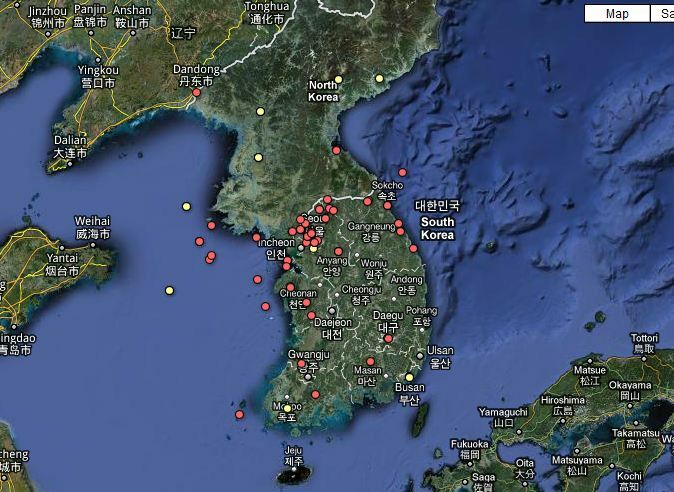 Here's a map detailing the 150 or so incidents between North and South Korea in the 50 years since the Korean War. “Are you worried?” asked P.E. Teacher #1 as we walk down the hallway after finishing lunch. I was just telling him how my friends have sent some worried emails to me regarding North Korea’s recent attack on South Korea. “Worried? No. Are you worried?” I respond. It’s been three days since North Korea fired artillery over their border and into a community on Yeonpyeong Island, killing two marines and two civilians. On TV, it looks like a nation in panic. In Daegu, everyone seemed nonplussed. But that’s just how it seemed. I like to think I know a lot about world events and world history, but it takes a situation like this to realize how much I don’t know. The facts I’ve learned could get me through a few rounds of Jeopardy, but it’s the human element — how do people here really feel — that I’m totally clueless on. 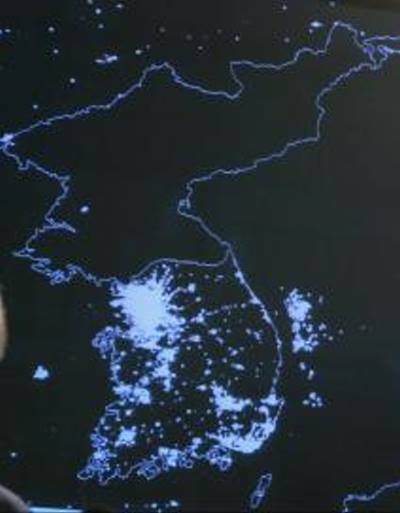 Sometimes you can tell a lot about a country by what you don't see: Here is a map of North and South Korea at night. The difference is staggering. So I decided to ask. For example, right after the attack, I asked one Korean friend why there was such an uproar over this attack that killed four when the North Koreans sank a navy ship in March that cost 46 sailors their lives and I didn’t hear about such a strong reaction. My friend responded that while North Korea has attacked military targets several times since the Korean War, this is the first time civilians have come under fire. And, just a few days previous to this latest attack, North Korea announced they had a modern nuclear factory with about 2,000 centrifuges. I follow P,E. Teacher #1 up to a teacher’s lounge where I’m joined by three more teachers, including P.E. Teacher #2, who usually translates some of the harder words and phrases for the other teachers (including myself). “But the North wouldn’t attack again, right? I mean, South Korea would fight back double and they’d risk losing their power. Right?” I asked the teachers. “That is our sense [thought/feeling],” P.E. Teacher #2 said. He was alluding to the North’s nuclear weapons. And P.E. Teacher #2 says many people believe if South Korea and the United States attacked North Korea, there would be a World War that would drag China and Russia to the North’s aid. One of the most surprising things I heard was some South Korean’s real fear of nuclear destruction. While most South Koreans are averse to escalating this conflict to the point of war, they are also widely critical of President Lee Myung-bak’s response to the attack. Click on the Incident Map above to go to the Guardian’s original map. UPDATE: New York Times does a great story about this. War,Bombs ,Politics,what has really happen in this insane world in 50 so years. Nothing,as America finds out every day in Afghanistan, and Iraq. Insane power is what this is about. Next post Winter in Korea: When will my school turn on the heat?